Belfast City Council has agreed to set aside half a million pounds for a controversial bonfire scheme which will see funds again directed to groups with links to loyalist paramilitaries. The programme, which first surfaced last year, gives money to groups for “area-based festivals” as a means of “bonfire diversion”. Over 400,000 pounds was given to groups with links to loyalist paramilitaries, including some which continue to engage in violence and crime, in the hope of reducing the chaos of the ‘Eleventh Night’ bonfires. Organised for the height of the marching season, the towering bonfires often trigger sectarian displays and disturbances which make international news. At a council committee, the DUP, Sinn Fein and PUP voted to allocate an increased #500,000 towards an ‘area-based festivals fund’ for 2019, which has now won the support of the full council. The funding also includes #100,000 earmarked for the West Belfast Festival (Feile an Phobail). Both Sinn Fein and the DUP have strongly defended the scheme. Sinn Fein councillor Ciaran Beattie said it led to a “huge reduction in anti-social behaviour in the Shankill area”, and meant “destructive and illegal bonfires did not take place in nationalist areas”. He said the funding for 2019 is “totally transparent and is open to all groups who can make a difference to defuse tension in the July and August period”. But the simmering controversy saw a mass walk out last week from a council meeting by councillors of both main parties. 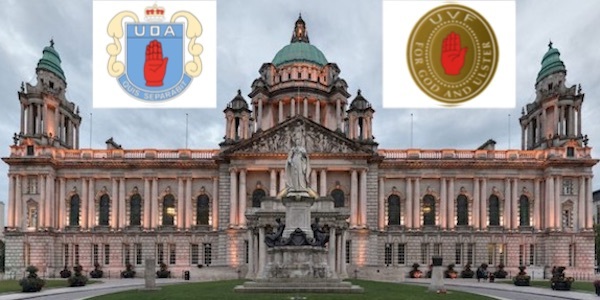 Dozens of councillors left a Belfast City Council meeting as a motion was raised over the failures of the ‘Social Investment Fund’ (SIF), which has in the past also been used to secretively channel cash to loyalist paramilitaries. The DUP and Sinn Fein say councillors excused themselves due to “conflicts of interest”. SIF was set up by the Stormont executive to provide support to projects in disadvantaged communities, but the fund has been used as a cover to support ‘preferred’ loyalists as well as political insiders on the nationalist side. In 2016, one organisation with links to unionist paramilitaries was awarded a giant payment of 1.7 million pounds. On Monday night, SDLP councillor Donal Lyons raised a motion which urged the council to “review the SIF report and apply any learning from it to relevant council funds”. But Sinn Fein and DUP councillors left the room while the matter was discussed before returning. With Sinn Fein declining to comment on the controversy, Mr Lyons accused the parties of showing “contempt for even the most basic levels of public accountability”.